The Cheatles for corporate hospitality? Yeah what a great idea! 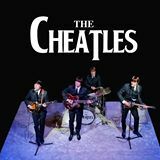 The Cheatles Vintage Beatles Band have been at the centre of many exclusive corporate hospitality packages, if fact they have just been booked to play for the VIP’s at the 2014 British Grand Prix in July! The Cheatles have a long list of happy business clients from years gone by. The band are in high demand at many international business events. Many times this corporate hospitality can lead to weird and wonderful places like the performance at The Bankers club on the very top of the HSBC tower in Hong Kong, the view was amazing! Or the corporate hospitality event for Madame Tussauds London, when we had to shift Beyonce out of the way but hey! who cares? Clients like to ask The Cheatles to perform for their corporate hospitality party or event and many times ask for advice on how best to produce the event. In this instance we can advise or consult and also recommend from our special list of corporate entertainment suppliers that we have grown to trust over the years. If your looking to produce a fabulous corporate party and need some help then please get in touch and get a free ideas consultation along with a list of trusted suppliers.